Dinah Washington, legendary singer and ‘Queen of the Blues,’ was born Ruth Lee Jones on August 29, 1924. Born in Tuscaloosa, Alabama she moved with her family to Chicago as a young child. Music was in Washington’s family, her mother was a pianist in St. Luke’s Baptist Church, and from a young age, Washington sang gospel and played piano with her church choir. Influenced by other female singers such as Billie Holiday, Washington began to take an interest in blues music and started playing in local clubs in Chicago. At the age of 18, Washington joined Lionel Hampton’s band and a year later she also signed with Keynote Records, releasing her first hit “Evil Gal Blues” under the name Dinah Washington. Washington was never to record any of her gospel music, despite her obvious talent for it, believing that the secular world of professional music should be kept apart from the spiritual. Washington’s penetrating and heartfelt voice ensured her success and, having moved to Mercury Records in 1948, she enjoyed a string of hits of the R&B charts, including “Baby Get Lost” (No. 1, 1949) and “Trouble in Mind” (No. 4, 1952). 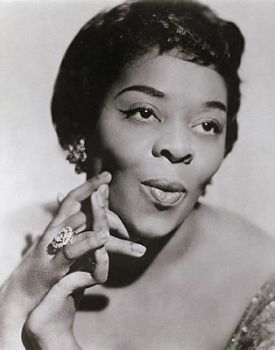 In 1959, she released “What a Diff’rence a Day Makes,” which some in the blues world criticized as being too commercial. Despite this, the song was a huge success in both the R&B and Pop charts in America and won Washington a Grammy Award. Many music historians have argued that this song and its accompanying album allowed Washington to move out of the race music (black) category, which so many African-American artists were bound to at the time, and cross over to the mainstream music market. By 1962, however, Washington’s record sales were falling, and despite a move to Roulette Records, she never again topped the charts. Nonetheless she left a strong legacy behind her, influencing artists such as Aretha Franklin and paving the way for African-American singers in the commercial popular music market. Washington has been awarded places in both the Grammy and Rock and Roll Halls of Fame; and in 2008 a street in Tuscaloosa was renamed Dinah Washington Avenue. Washington’s private life was sometimes tumultuous; she was married seven times, divorced six, and battled both weight problems and addiction to diet pills all her life. She died at the age of 39 on December 14, 1963 in Chicago due to an accidental overdose of prescription sleeping pills. Jim Haskins, Queen of the Blues: A Biography of Dinah Washington (New York: William Morrow and Company, 1987) Queen; The Life and Music of Dinah Washington Website, www.dinahthequeen.com, (Nadine Cohodas, Random House, 2004); The Verve Live Music Group, www.vervemusicgroup.com, (Verve Music Group, 1999-2009); Encyclopaedia Britannica, www.britannica.com (Encyclopaedia Britannica Online, 2009). Britannica, www.britannica.com (Encyclopaedia Britannica Online, 2009).